I have given a lot of though to starting up my weekly challenges again, and decided against it because of all the hard work, and because we all lead such busy lives that a weekly challenge is too difficult to achieve. So, I have come up with a new monthly challenge theme I Made It. It does not matter where you live in the world, this is a challenge open to everyone and anyone. How will it work? On the 2nd of the month, the host will put up the I Made It challenge. Included in the challenge will be a blog hop code, which each blogger will have to put into their post. 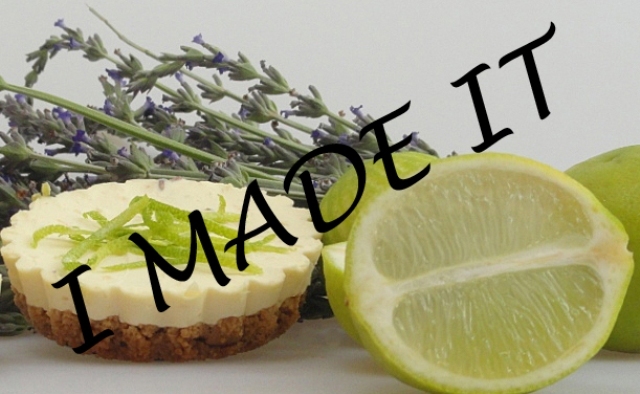 Each blogger who takes part will post the I Made It recipe anytime during the month, but all posts have to be done in the same month as the challenge is issued. In order to make this work, I would like a commitment from at least 20 bloggers. If you commit to taking part, you will also be given first option on hosting. There is no obligation to host but it will be a great way to really participate in this theme. It will not be compulsory to take part every month, the only obligation I require is that you take part the first month the challenge is issued. Why a challenge? I have found that there are a lot of recipes I would like to try and never do, and if challenged, this may be more of an incentive. In the past I have hosted challenges to make soufflés and macaroons and these challenges have taken us all out of our comfort zone. Why something new? A lot of existing groups are difficult to join as they are already large, and oversubscribed. This challenge will allow us all to be the part of something new, and we can all steer it in a way that will make it stand out. How do I join? Fill in the form below and if I get enough people showing a clear interest then I will start the challenge. As a little incentive I will be giving away spot prizes to randomly chosen bloggers who sign up. Cool idea.what’s a blog hop? I don’t cook enough to take part. Living alone I tend to make the quick and easy stuff, and only make the effort when it is for others. This sounds interesting! I’ll have to think about it! I would love to participate, Tandy, but I hardly get time to read blog posts, recently and I am really missing it. I hope you are well? Thank you BAM! I am hoping it will work 🙂 Hope you had a great weekend! Same here Tandy. I’d love to join in but am already committed to too many challenges as it is. Lovely idea though and I hope you get lots of interest. Thank you Claire, I hope so too! Hope it goes well, will enjoy reading it but can’t commit right now! It sounds like a great challenge. What an outstanding idea Tandy – just not sure I can commit at this stage with all that I have on my plate – I have already taken my posts down to 2 a week. I really would like to participate but don’t want to let you down.